teacher presence | A . T . T . N ! Faculty Focus published Ten Online Teaching Tips You May Not Have Heard, a refreshing read. I will recap the ones I thought are the best “reminders” that you may have heard once or twice but it’s not everyone’s focus. However these tips are truly great and probably something your online students are expecting more and more. 1. Do a Welcome Email – …Send a private email, addressing each student by name, and asking a direct question to start a brief dialogue. 2. Text (SMS) Opt-In – Tell your students to opt in for text notifications in D2L. They can do this by logging-in to D2L, clicking on their name, and going to notifications (see below). This also increases the chances of them seeing any updates thus creating less excuses for not being in the know. 3. Communicate Information Using Multiple Channels – If you have important information to convey to students, don’t use just one channel of communication, use multiple. For example, instead of simply posting information only in the announcements area, or only in the feedback area, or sending it only via email, include the information in all three of these places. This will reduce the number of students saying they did not get the memo. Posting information in as many places as possible will result in more students getting the information they need to succeed. 4. Sync School Email Account to Phone – Contact your institution’s help desk for instructions on how to sync your school email account to your iPhone or Android. Not only will receiving email in multiple places reduce your likelihood of missing messages, it will also allow you to address urgent questions and concerns in a timely fashion. Students are often pleasantly surprised at my response time. However, it is important to set boundaries by letting students know when to expect a reply. For example, you can inform them that you normally respond within a 24-hour period, during regular business hours. This will help maintain your work-life balance. 5. Keep a Running List of Resources to Include in Feedback – Compile a list of helpful resources to send to students who are struggling in certain areas. For example, if a student submits a paper that illustrates he or she does not know how to use commas, don’t just point out the mistake, but refer to your list of resources and include the appropriate resource in your feedback. A Word document, bookmarks folder, or desktop sticky note are great places to keep these resources handy. P.S. Be on the lookout for our post on Intelligent Agents in D2L, because they can help you with #1 and #5 from this list to be automatic if set up ahead of time with the right criteria. Here is another interesting post from Faculty Focus, written by Cheryl Hayek, associate provost at Grantham University, in 2012. To read the full article click here. Here are the steps she suggested. I quite enjoyed her analogy! Ask for citation/reference to support the student’s view (from the week’s class readings usually. everything they find extra is their choice if they want to dig deeper). Provide examples of a “good” and “bad” discussion post and a reply to a post (if you don’t write up examples but really like a student’s post you can ask them for permission to show it to the other student/put it in your syllabus as a “good post sample”). Focus on the quality, not quantity of student posts. If a student posts too many threads or replies but have not said much or cited, they probably did not fully engage. – However, sometimes by posting many replies they just want to acknowledge that they have read their classmates’ posts and agreed or liked it, so that is nice. My point here – it is the best to require one substantial post where they would express their opinion and cite a relevant resources, and require at least one or two replies. Anything over that can be overwhelming, but if they only say “I agree” or “Good point” let them be, just don’t necessarily consider it if you are grading their discussion posts. Teacher and social presence and engagement with other classmates and the course materials continue to be the greatest indicators of success in online classes. 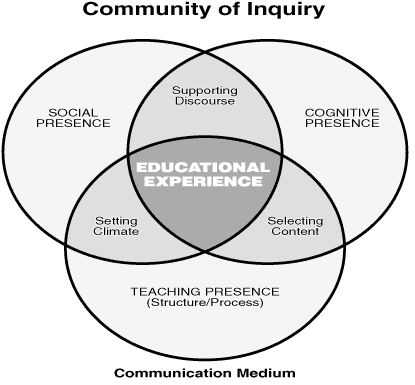 Community of Inquiry (CoI) framework is a framework developed by Randy Garrison, Terry Anderson et al. (University of Calgary) to help the educational experience of e-learning. It is based on the three “presences” in the classroom: social, teacher, and cognitive. 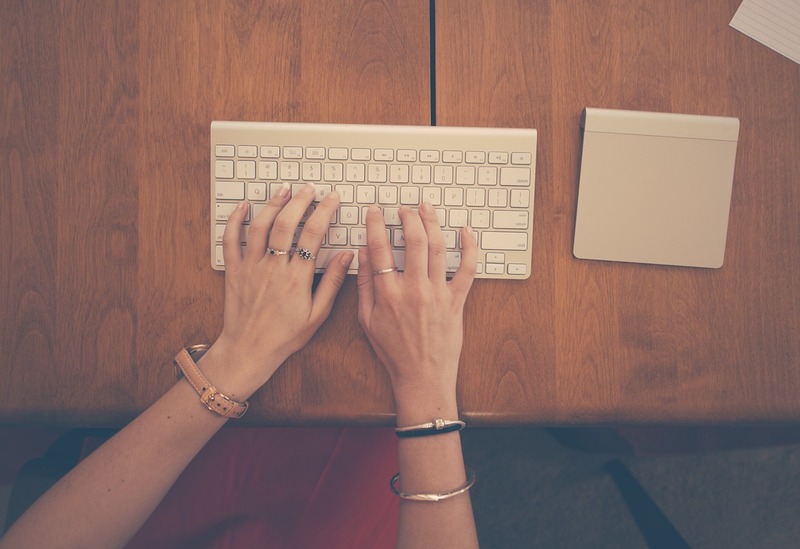 There are many ways for teachers to show their presence in an online course. starting with clearly communicated course objectives and due dates, providing feedback in a timely fashion, encouraging discussion within the course, etc. Click here to access the interactive map (you can click on each term) of CoI framework and learn more. Online teaching should be “just-in-time” teaching. Instructors need to be every bit as mindful of timeliness and urgency in an online course as they are in a face-to-face classroom, and maybe even more so. In a traditional classroom, you wouldn’t normally answer a student’s question with, “I’ll get back to you on that in a few days,” or worse, with a sort of blank, unreadable stare (“Did the professor hear me? Do I even exist?”). But that is the impression created when you fail to respond to emails in a timely manner or leave essays sitting unattended in an online folder. Does that mean online instructors need to be on call 24-7? No. It is perfectly acceptable to maintain business hours, or to set your own quirky hours, so long as you communicate those time limits to your students. Standardize your course schedule. With students checking in at various points, it is up to the teacher to create some moments of unified class time. 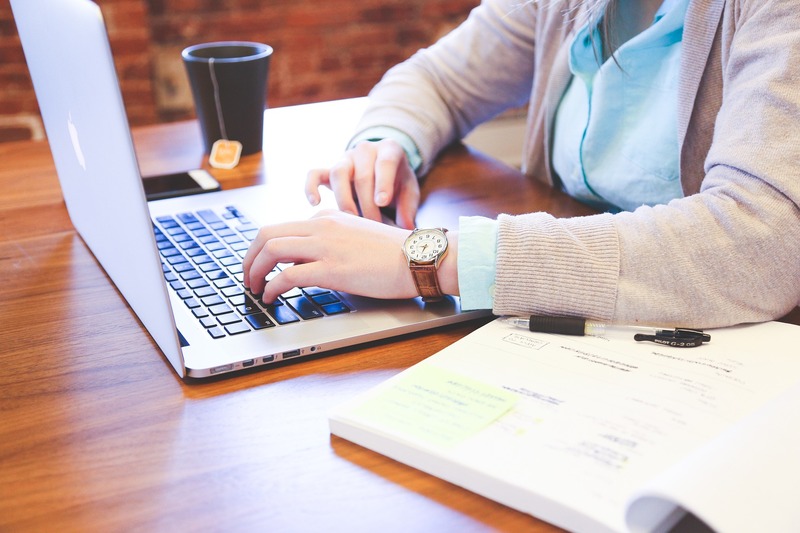 In online courses, students are generally free to take advantage of looser scheduling, completing assignments on Monday and Wednesday one week, and on Tuesday and Thursday another week. But I strongly recommend that you not take the same liberties in structuring your due dates or grading. I have seen online courses in which due dates were rotated on three-day, four-day, and five-day cycles, to the confusion of all.Instead, I standardize my due dates — discussion posts are due on Tuesdays and Thursdays, all other projects on Fridays by noon, for example… I am as explicit as possible about when exactly I’ll be doing my grading: “I expect to be grading these assignments on Sunday afternoon, so look for my responses then.” If I have to vary my schedule, I announce the change: “I’m a little behind, but will be completing this round of grading on Monday between 1 p.m. and 5 p.m.” Such small courtesies matter an extraordinary amount to online students.